Walk a mile in my shoes is a relatable topic. Everyone has a god gifted life and one should be happy with what the Almighty has given them. But it doesn't seem that many people are happy with their life. Others personal life intrigues them and they start prying into others personal space. It is not a right thing to do before you are completely aware of what the other person's life is! We as Indians are good at judging people and jumping to conclusions. We don't need a court of a judge to give the verdict. We are our own judges who can enter personal space of people and sneak peak into others life. You won't understand the pain of the person and it might be easy for you to make public discussions about something that is personal to them. Understand that everyone has their own life and we need to worry about our life because that is what should matter the most to us. Never compare your kids with your friend's kid or Sharma ji's kids. You were the one who worked hard for your children. Support them by creating and giving them a better standard and quality of life for them. Comparing them will only break your children's morale and confidence. Never express unwanted sympathy for people with terminal illness. You never lived their pain and their pain might be unknown to you but known to people who care them the most. They have walked through the terrible rocky roads full of struggles and pain. Help them by making them better instead of showing them fake sympathies. It is the most difficult situation in anyone's life. You all should walk a mile in someone's shoes before you get judgemental about someone. Stop poking your ugly nose into someone's personal area and leave them for their own good. Trust me, life will be more beautiful if you mind your own business and let others mind their own business. Almighty has designed everyone's life in such a way that they get an equal proportion of everything. It's just that some unlucky ones get the most of it and live a terrible life. 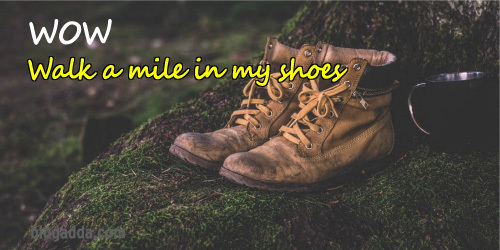 "Walk a Mile in my shoes.."
Did you like this post? Get The Solitary Writers updates via Facebook or Twitter, better yet, subscribe to it via RSS Feed. It’s easy and free! Comments are just another way to let me know how you feel.Don't forget to comment. What a great post!! A true piece of advice for judgmental Indian Aunties.